One of thirteen children of Walter and Mary Perrins, Albert was born in Hendon Middlesex, but moved to Bole Hill, Calow as a young boy. On leaving school he worked as a carter in a brickyard and he joined the war effort in December 1915 and after initial training was sent out to France By 1917 he had fought through some of the most notorious battles of the war, at Scarpe and Arras, before moving on to Belgium and the battles of Ypres and Langemark. And it was at Langemark that it is recorded the soldier was taken prisoner by the Germans and transported back to Germany where he was held in the Stendal POW camp. He was there for only a short time before he died. His father was informed by the British War Office that his son had died of ‘intestinal infection” on 7th July 1918. The soldier was eventually buried in Berlin South-Western cemetery near Brandenburg, Germany. In 1922-23 it was decided that the graves of Commonwealth servicemen who had died all over Germany should be brought together into four permanent cemeteries. Berlin South-Western was one of those chosen and in 1924-25 graves were brought into the cemetery from 146 burial grounds in eastern Germany. Private Perrins in buried in plot III. B. 3. One of eleven children of Walter and Mary Perrins, Harry was born in St Albans, but moved to Bole Hill, Calow as a young boy. His brother Albert also perished in the war. Harry volunteered for war effort in December 1915 and was assigned to the Army reserve unit which remained in England until March 1917 when he was reassigned to the Sherwood Foresters and sent to France. In September 1918 he was promoted to Lance Corporal but he was killed just three weeks later on the 3rd October, aged 22. He died defending the French village of Ramicourt, against a ferocious German attack, and is buried close to where he fell. Private Perrins is buried in Grave Ref: A43. Information taken from Brimington Memorial 1914-1918. Calow. 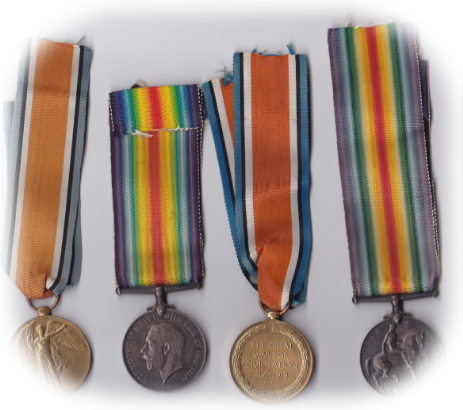 Photograph below of their war medals.